First things first, I think Quentin Tarantino makes weird movies. Granted I haven't seen many of his movies (I've only really seen three: Pulp Fiction, Kill Bill, and Grindhouse), but the ones I've seen all have this common elements of being very strange and just a little bit insane. They have their charms though, which is why I couldn't resist this newest addition to the Tarantino brand of (genius?) madness. That, and Brad Pitt. 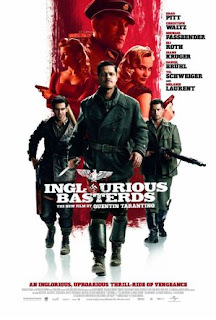 Inglourious Basterds is -- as described by the man himself -- a "spaghetti Western movie with World War II iconography." But since I don't really have trivia knowledge about movies, that doesn't make sense. To me, Inglourious Basterds is a vengeance movie against the backdrop of World War II with Nazi-occupied France as the setting. The movie basically tells two stories. On one side, we have a group of degenerate Irish-American soldiers organized under the leadership of Lt. Aldo Raine (Pitt) whose sole mission is to ambush and kill Nazis, Apache Indian-style. Their brutal ways soon earn them the nickname of "basterds" by the Germans. On the other side is the story of young Jewish cinema owner, Shosanna Dreyfus (Melanie Laurent), whose entire family was massacred by Nazis led by SS Col. Landa (Cristoph Waltz), nicknamed the "jew hunter." By a series of coincidences, Shosanna's cinema is chosen as the venue for the premier of an important German propaganda film, where many of Nazi Germany's whos-who, including the Fuhrer himself, would be in attendance. Shosanna sees this as an opportunity to exact revenge and plans to kill everyone by burning down the theater. Meanwhile, the Allied Forces have also taken note of the event. The British army sends their own trooper in the form of snappy, former film critic soldier who speaks fluent German to work with Lt. Raine's "basterds" and have a rendezvous with Germany's celebrated film star and spy for the British, Bridget von Hammersmark (Diane Kruger). But, as with many of Tarantino's films, things don't always go as planned. Cristoph Waltz, the actor who plays SS Col. Landa, is brilliant. No wonder he won the Best Actor Award for his role at the Cannes Film Festival where this film was entered. Tarantino reportedly feared that the character would be unplayable but after the film was made he was also the first to admit that Waltz became the character for him. It's hard to put in words what Waltz did for the character. By itself, the character of SS Col. Landa is a masterpiece -- a monster through and through but also cultivated, brutal but also charming, intense but also comical. Waltz inhabited this character, got into his skin and became SS Col. Landa for the movie. The experience of watching it is exhilirating. The dialogue. Sure, there's the handicap of having to read it (most of the dialogue are either in French or German), but Tarantino has a knack for making really interesting dialogue and it still shows. I really, really like listening to French. German's okay (I like Russian better). But French is just beautiful. Surprisingly, Brad Pitt's character doesn't really click. Lt. Aldo Raine is a comic book character, completely flat with nothing to offer but a permanent smirk and a thick accent. The movie never did explain why Diane Kruger's character turned traitor to her own country. I'm left only to speculate that maybe she, like most Germans at the time, believes that Hitler is soon going down and that she better make peace with the allies so she won't become an anathema after the war is over. The movie also doesn't explain how Shosanna managed to own that theater. Sure, there's that story about an aunt, but I'm guessing she lied about that just as she lied about her name. How did she manage to get under the German's radar, especially with a hounddog like Landa on their payroll? A real interesting, star-studded movie not only for fans of Quentin Tarantino but also for those who like World War II nostalgia and a little insanity.